Review: I've been wanting to read the third book in this series ever since it came out earlier this year, but couldn't really remember what had happened in the first two. Solution? Audio books! Please remember that I am reviewing the RECORDING of these books, not the story. 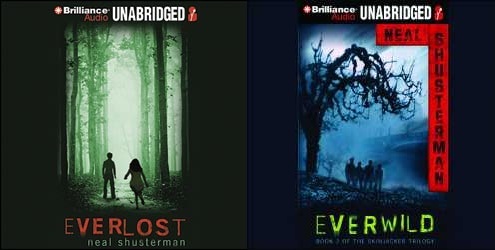 I've always been a big fan of Shusterman. I LOVE this series. However, I was not a huge fan of the audio books. The narrator had kind of an annoying accent. One of the main characters in this series is named Allie. But the author had an accent that made him say the name E-allie, as if it had an E at the beginning. This drove me CRAZY! I flinched every time he said it. Also, he had some really weird voices. His main character voices were good, and his villian voices were good, but his secondary characters all sounded like cartoons, idiots, or idiotic cartoons. It got old fast. The people in this book are supposed to be strange, but listening to a ton of characters who sound like a mixture of Goofy and the three stooges was a little more than I could take. All in all, I'm glad I listened to this so I could be ready for the final book in the trilogy. But I would NOT recommend listening to these unless you've actually READ the books first. The recordings would probably stop you from liking the story. That's too bad that the narrator was no good. For an audio book the narrator can for sure make or break a book! I loved the first book. I've got to get the rest read! Just as a different point of view, I listened to all three books in the Skinjacker triology and Loved them, even before reading the books. I loved Podehl as the narrator. But I can see why you didn't like him so much. And Everfound is AWESOME. A little long, but so good. I listened to the 1st book on audio as well (I haven't read the rest of the trilogy yet) and I really liked it. I didn't like Nick Podehl at first , but he really grew on me, and by the end, I loved him. I even searched out other audio books that he had narrated.